he Mamluke established their capital in Cairo in the 13th century, and the city became renowned throughout Africa, Asia, and Europe. Cairo declined after the mid-14th century, however, when the epidemic of bubonic plague known as the Black Death struck the city, decimating its population. The Ottomans conquered Cairo in 1517, and ruled there until 1798, when the area was captured during an expedition led by Napoleon I of France. Ottoman rule was restored in 1801, but by the middle of the 19th century Egypt's foreign debt and the weakness of the Ottoman Empire invited greater European influence in Cairo. The Viceroy Ismail Pasha, who ruled from 1863 to 1879, built many European-style structures in the city and used the occasion of the opening of the Suez Canal northeast of Cairo in 1869 to showcase the city for the European powers. However, much of the development that took place during this period was funded by foreign loans, which led to an increase in the national debt and left Cairo vulnerable to control by Great Britain. The British effectively ruled Egypt from Cairo from the late 19th century through the period after World War I (1914-1918), when the foreign presence in Cairo began to diminish. Cairo's population grew rapidly in the in the war years, reaching 2 million by the outbreak of World War II in 1939. Since that time the city has continued to boom in terms of both population and development. Some of this population growth has resulted from the influx of refugees from cities along the Suez Canal that were damaged in the Arab-Israeli wars of the late 1960s and early 1970s. Many new residential, commercial, and governmental structures have changed the city's landscape. Tourist facilities have proven an important source of foreign revenue for Egypt, and have thus drawn heavy investment from the government. 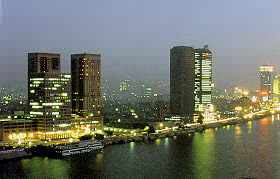 Cairo has also benefited from Egypt's growing international prominence. The founding of the Arab League in 1945 made Cairo a political capital, as has Egypt's ongoing participation in the Middle East peace process. However, in 1981 the city witnessed a tragic event when Egyptian President Anwar Al-Sadat was assassinated at a military parade by Islamic fundamentalists within the Egyptian army. In 1992 an earthquake that killed more than 500 people and injured about 6500 others shook the city. Also, Cairo is an important centre for publishing and other forms of media. Its newspapers, which include Al-Ahram (founded in 1875) and Al-Akhbar (1952), exert wide influence within the Islamic world, as does Radio Cairo. The rich cultural life is further enhanced by local theatre, cinema, dance, and music, in addition to the city's vibrant community of journalists and fiction writers; Cairo residents take great pride in the work of Nobel Prize-winning author and Cairo native Naguib Mahfouz, whose fiction has provided a chronicle of the city.